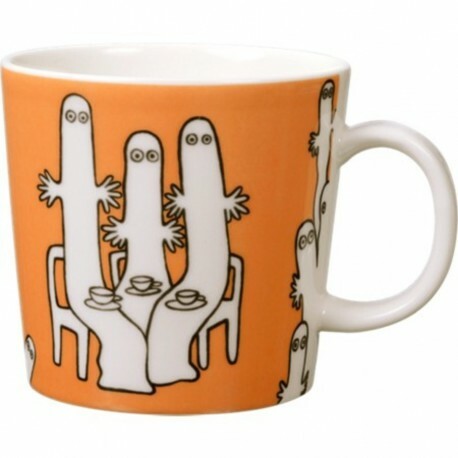 The beautiful orange Moomin mug featuring the Hattifatteners was released in 2006 and was drawn by Tove Slotte-Elevant. The illustration can be found in the original picture book "The Book About Moomin, Mymble and Little My". Small white ghost-like creatures that resemble worn socks. Hattifatteners are always on the move and travel in large groups (but always in odd numbers), such as boat convoys. Their only goal in life is to reach the horizon. During their travels they never say a word to each other, and it is doubtful that they have the ability to talk at all, they seem to communicate solely by telepathy – except in the comics, where they complain bitterly to their host Moomin about the lack of food, cocktails and beds. The Hattifatteners cannot see very well, but their sense of touch is very strong, and they can feel ground vibrations and electricity. Hattifatteners assemble once a year when they "recharge" in a thunderstorm. At this time they should be avoided since they are highly charged and can give you electrical burns. Despite physiologically resembling animals, Hattifatteners grow from seeds. Planting Hattifattener seeds where someone has taken up residence is an effective way to get rid of him/her. Hattifatteners can only grow from this seed if it is sown on Midsummer Eve.